Okay, folks. if you’re eating you may want to stop reading. I am going to talk about something gross. Dog poop! There I’ve said it. Are you still reading? If so, did you know that April 1 -7 is International Pooper Scooper Week? 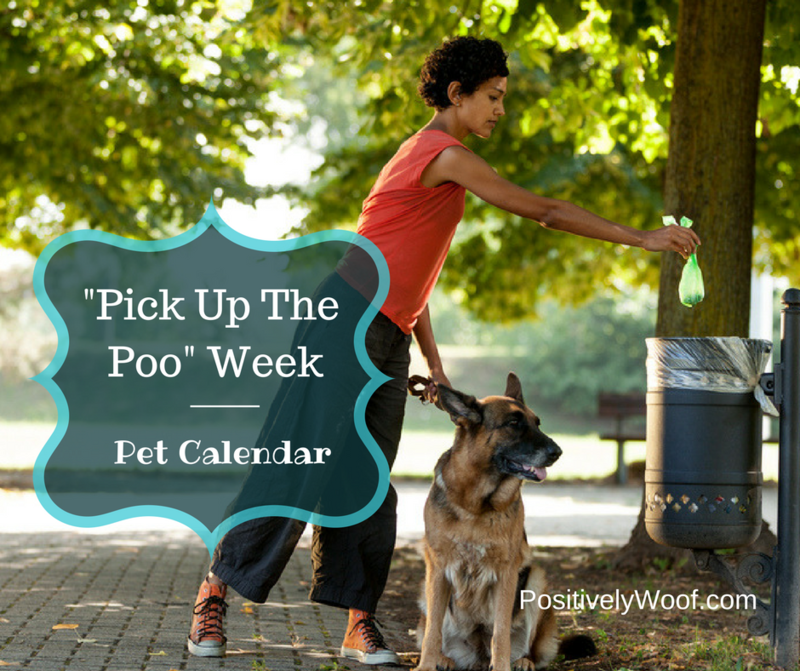 An entire week dedicated to picking up your dog’s poop. In 2002, the International Pooper Scooper Week was created by the Association of Professional Animal Waste Specialists. Why? To educate pet owners about the importance of picking up their dog’s poop. Because of the many walks I take with my dogs, I believe the week was started because there is always evidence of pet parents who simply let their dogs poop whereever they want and then they just walk away. I see far too much poop in the middle of a village sidewalk, the middle of the road or even in areas of my own yard in which my dogs don’t do their doo-doo. Gross! Just because I have dogs doesn’t mean I want your dog’s poo in my yard! We have specific areas where the dogs visit Mother Nature; it makes it easier for us to clean one area and helps assure we don’t step in poop when we’re in the yard. Please tell me why you won’t pick up after your dog? Why do you think it’s okay for your dog to poop in our yard? Is picking up my poodle’s poo the highlight of my day? Not really. But because I am a responsible pet mom I always have bags with me and I pick up after her. It’s biodegradable. It will break down and fertilize the ground upon which it’s left. The neighbors will have “better grass” because of my dog. If my dog goes off trail and poops in the high grass, who cares, no one will step in that. You don’t know that everyone will stay on the path. It’s gross. No doubt about it. It’s your dog, it’s your responsibility. I don’t want to carry a bag of poop for my entire walk. Who does? Plan ahead, people! If your dog poops within the first few minutes of your walk, take a route that takes you past a trash can so you don’t have to carry it for miles. “No one else” is picking up. This reminds me of what my mom used to say, “If everyone jumped off a bridge would you?” Just because others are lazy, doesn’t mean you need to leave your dog’s poop lying around. I didn’t bring a bag. The dog park is out of bags. Be prepared. You know you’re walking. You know your dog will poop. Therefore, you know you need to carry a bag. Simple as that. Leave bags with the leash and harness so you never leave home without them. Reasons to pick up the poop! It’s gross. Yes, you’ve already said “it’s gross” but think how gross it will be for someone to step in your dog’s poop. It’s rude to leave your dog’s waste in another’s yard or on a sidewalk. Don’t justify it by saying your neighbor has a dog so what’s a little more poop. It’s not his responsibility to clean up after your dog. Also, your neighbor might be like us — our dogs have a designated area in which to poop. 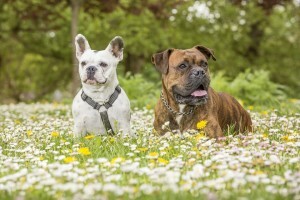 Dog feces is full of bacteria and doesn’t need to be left lying around. Pick it up. Carry hand sanitizer with you and then wash your hands when you get home. If no one picked up their dog’s poop, it would eventually be washed away and into our water supply and contaminate it. That may be an extreme example, but if everyone stopped picking up after their pet, it could happen! 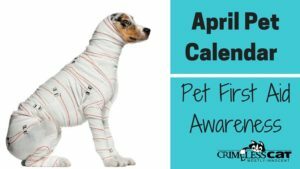 Being a pet parent means being a RESPONSIBLE pet parent and that means for the good and the not so good. Doggy snuggles on the couch = great! Picking up poop = not-so-great, but necessary! 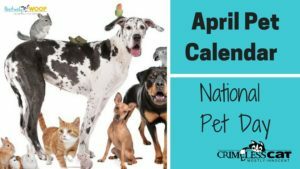 Read the rest of our April Pet Holiday Calendar. Dog Rescue Stories: Five Sets of Pawsome Have Fostered Over 200 dogs in Four Years!